Newspapers are making great strides to modernize for today’s consumers, Thad Ogburn, Raleigh News & Observer metro editor, said Friday. As print media have experienced a rapid decline in readership, newspapers like the Raleigh News & Observer are doing everything it takes to survive. And to find a way to thrive, he said. “Knock on wood, the worst seems to be over,” Ogburn said. There was a time in the last few years when revenue decreases caused contraction of departments at the paper, said Ogburn. Ad revenue was partially at fault for the downsize, Ogburn said. But since, they have started selling ad sales online. 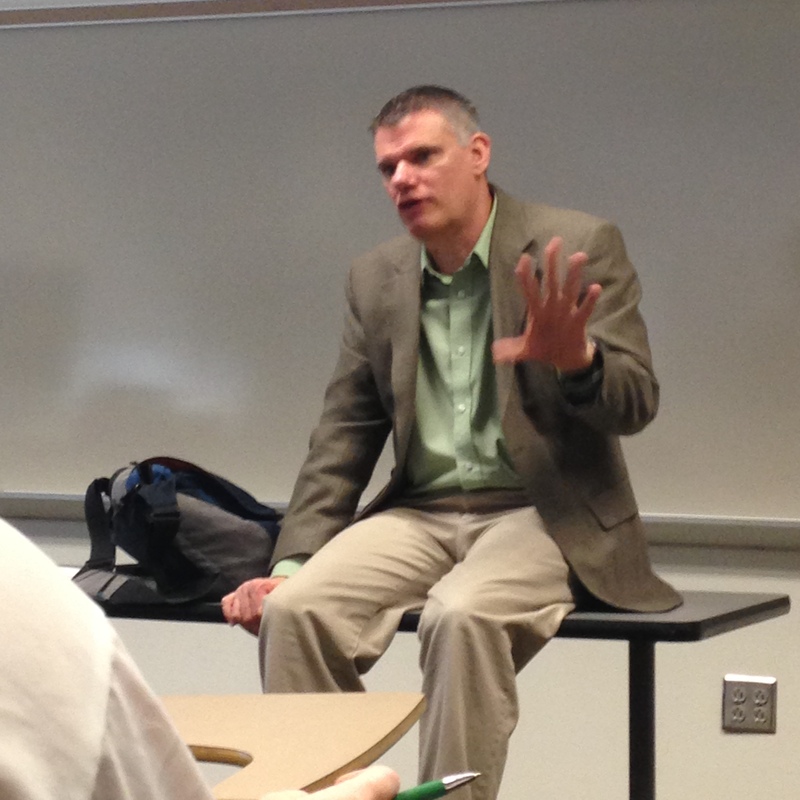 Thad Ogburn, metro editor of The Raleigh News & Observer speaks to a class at Elon University. Nowadays, newspapers are creating content for their websites as much as they are for print. It’s easy to create content for the website, Ogburn said. Websites run stories that use a quick, inverted pyramid structure, said Ogburn, while print news goes beyond a straight news story into something deeper. One of the biggest changes the paper has made in the last few years is incorporating videography, Ogburn said. “One of our newsroom goals is to get all of our reporters to shoot video.” The addition of video to web content enhances viewers’ interaction online, said Ogburn. “There is a great appetite for news, we just have to adapt how we do it,” Ogburn said. Subscriptions now include technology; devices like smart phones and iPads can access the Raleigh News & Observer anywhere, anytime. With all these newsroom advancements, now is the time for interns to showcase their talents, Ogburn said. The Raleigh News & Observer is looking for students whose passion and talents are evident in their work. Ogburn said the best interns are those who get out there and take the initiative. Interns who are determined to be a part of what’s going on. Get out there and promote your self and your work, Ogburn said.